The holidays are almost here! In my opinion, it's one of the best times of year & one of my favorite ways to celebrate with family & friends is by enjoying a festive cookie! 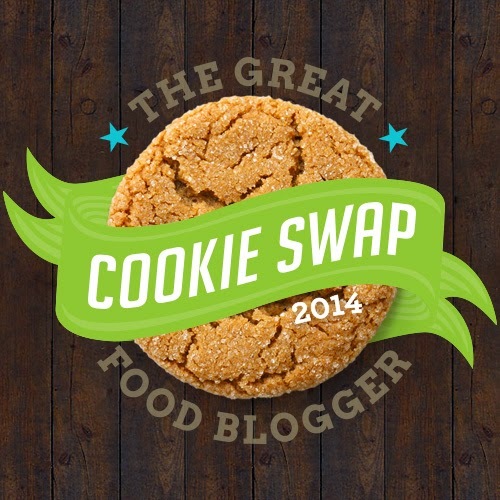 This year, to help get me in the mood for baking some tasty cookie treats, I participated in the Great Food Blogger Cookie Swap & it was so fun! This is my first year but this awesome online event has been happening for four years. 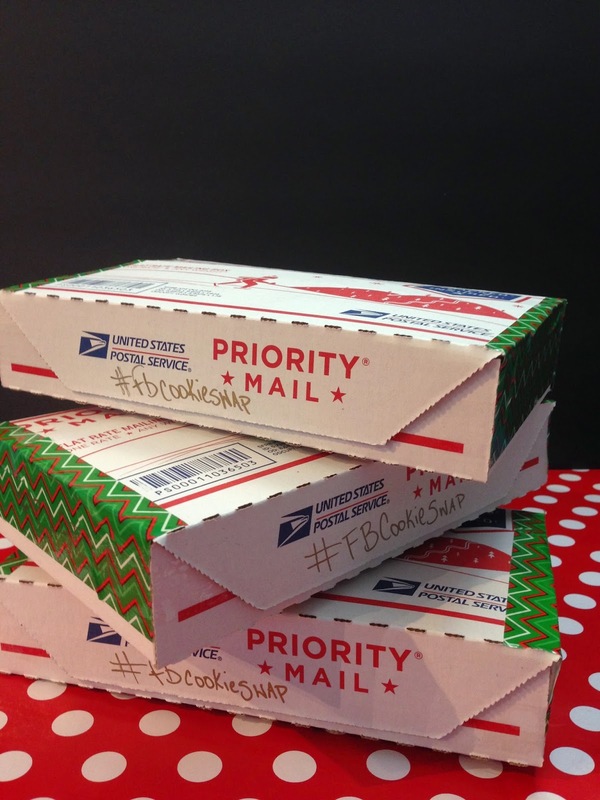 Food bloggers get together & are paired with other food bloggers, Secret Santa style. You create a new cookie recipe, bake it up & send it off to your three matches....folks from all over the country! 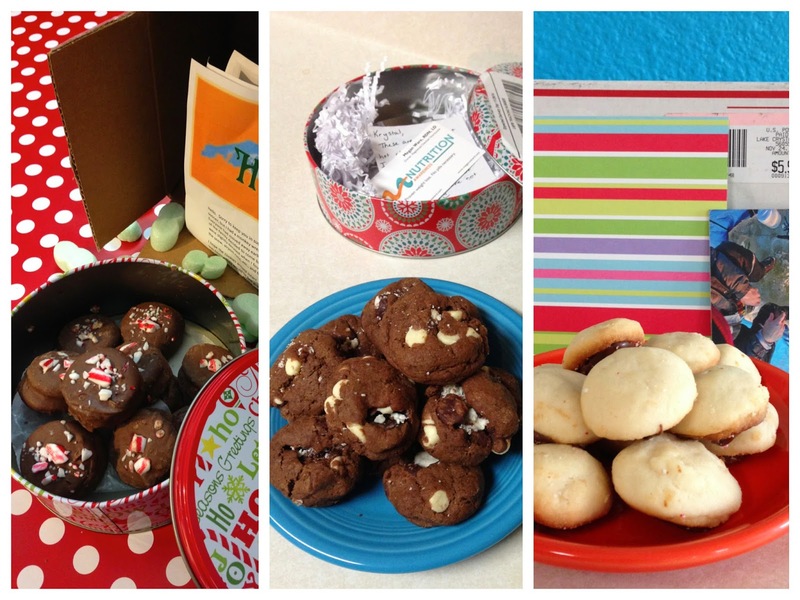 In return, you get three boxes of sweet morsels from three completely different bloggers! Everyone writes about their experience & shares their recipe on their blogs. It's a really great way to send some baked love to fellow bloggers who become new friends....& a fantastic way for everyone to get new cookie recipes! Be sure to check out all of the recipes from the swap, they'll definitely be winners for your holiday dessert tables! Let's start with the delicious goodies I received. I got Chocolate Peppermint Marshmallow Sandwich Cookies from Hye Thyme Cafe, Peppermint Hot Chocolate Cookies from Nutrition Awareness, & Peppermint Chocolate Cookies from Pickles Travel Blog. Oh wow, each & every one was so good! Worthy of a prominent spot on your cookie plates for the special people in your life. I love that each cookie I got to try featured peppermint & chocolate, one of my favorite flavor combos, especially for the holidays. I will absolutely be logging on to my partner's websites today to grab their recipes! And surprisingly, every package of cookies I opened held up so well! I have to commend the USPS for a job well done. I was afraid that the cookies I sent would end up being nothing but crumbs & that the ones I received might have the same fate, but every cookie in each box I got was still intact. Very impressive. And hopefully the treats I sent arrived just as well. Now, for my soft nutty snowballs. I sent them to Culinary Couture, Hall Nesting, & It Bakes Me Happy. One of my favorite cookies has always been pecan sandies or Sand Tarts as they are called in my family. It seems that most families have a variation of this cookie & the varieties I've had have always been incredibly tasty. I love that they are simple, filled with pecans (tops in my book) & buttery. Mmm, butter. My grandmother also likes these & makes them often for Christmas. I decided to mix the tradition pecan cookie recipe up a little bit. I kept in plenty of pecans but added in a few rich macadamia nuts to make them a little fancier & more decadent. Because Christmas cookies deserve it. As do your taste buds! I also decided to drizzle these beauties with a touch of dark chocolate rather than the normal powdered sugar. I thought they would travel much better this way. As listed in the recipe below, they can either be rolled in powdered sugar or topped with chocolate. Both ways are worth the calories. 3/4 c. powdered sugar, for coating or chocolate melting wafers for drizzling. Whip butter on medium to high speed for 30 seconds. Cream in sugar, until combined, scraping sides often. Mix in egg yolk, milk & vanilla. Beat in flour & salt. With a wooden spoon or rubber/silicone spatula, mix in both nuts. Cover & chill for at least 30 minutes, but no longer than 60. Preheat oven to 325 degrees. Using a cookie scoop, make small dough balls, 1 in. or so & place on a parchment lined cookie sheet. Bake 12 - 17 minutes or until the bottoms are lightly browned. Cool cookies completely on cooling rack. To garnish, choose from either option. Melt a few chocolate melting wafers or chocolate chips & drizzle over the top of each cookie. Or place powdered sugar in a large zip top plastic bag & adding a few cookies at a time to the bag, shake (lightly!) to cover in powdered sugar. The manager at this place for NY events and all other guys worked with us from the beginning till the end of our event. The food here was not just amazing, it was legendary.